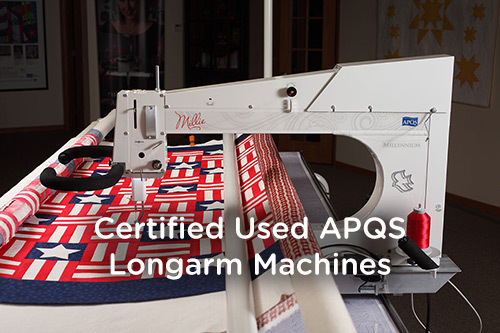 Home / APQS Longarm Machines / Certified Used APQS Longarm Quilting Machines Just Released! I was just notified that APQS is about to release some used machines and I wanted you to know about them! These generally don’t last long so if there is one you are interested in, call Angela at (502) 718-7148. All of these machines are “L” bobbin machines but can be converted to an “M” bobbin for $500. All come with a one year warranty. They all come with a table – your choice of size and if you’d like to add Bliss to the table it is $1,000 to add Bliss. You can also add a Motorized Fabric Advance to Millie or Freddie for $1,350. All of the used APQS Longarm machines have been sold. Want to be the first to know when certified used machines are available? Click here to join our mailing list!